View of the the town of Richmond, Yorkshire, perched attractively above the steep Swale Valley. 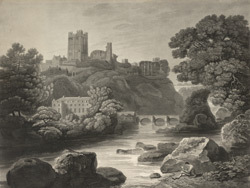 Although the importance of the castle to the town had declined by the 18th century, it was flourishing for another reason. Daniel Defoe wrote: "Richmond is a large market town … here you see all the people, great and small, a knitting, and at Richmond you have a market for woollen or yarn stockings ... it is indeed a very considerable manufacture in itself, and of late mightily increased too, as all the manufactures of England indeed are."